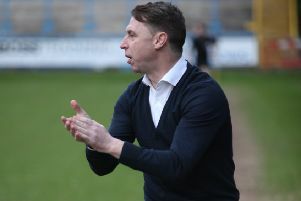 Town boss Jamie Fullarton praised his “excellent” Halifax side after their 0-0 draw at Barrow on Saturday. The Shaymen were the better team on the day, but failed to turn their superiority into three points, and wrongly had a Matty Kosylo goal chalked off for offside in the first-half. Striker Scott QUigley is still to find the net for Town, but went close on more than once occasion. “I thought we were in complete control of the game,” said Fullarton. “First-half in particular was an excellent performance all-round, in every aspect, and we created a number of opportunities. “Not only that, but defensively we were under no pressure, we looked assured. There was a real understanding of what we were trying to do, and more importantly, with the intent to do it. “We exposed Barrow throughout the half. The offside goal I’d need to see again, and we hit the post and had a number of opportunities. “I think it was enjoyable. Second-half we didn’t create as much but we were in complete control of the game, and never under any difficulty to the point that they never had a shot on target, or any passages that created anything inside our box. “Playing away from home at a team that’s got one of the strongest records at home, I thought it looked like we were the dominant side throughout. “But at the risk of repeating myself, the performance was of a level that merited more. “We created enough chances and we were really assured out of possession, with good structure and shape. “I think it demonstrates where we’re at at the moment in terms of performances, and with getting players back, competition for places. “I thought we were excellent. Our ball retention, how we kept the ball and worked those opportunities, was enjoyable. When asked if the main negative for Town was again lacking a cutting edge in-front of goal, Fullarton said: “I don’t see it as a negative. If you’re not creating chances, then you start worrying as a manager. “Obviously the conversation over a period of time has been the same - we’ve got to increase our ratio of chances to goals. “But you’ve got to have a consistent performance level to then try to have a consistent outcome. “If you’re playing poorly and stealing draws, then worry. But we’re not. We were comfortable, controlled, assured. We played some excellent football throughout, and it was pleasing. “The disappointment, as opposed to a negative, is that we didn’t convert a chance. Well we did convert a chance if you want to be pedantic about it. On Blackpool loanee Quigley, Fullarton said: “You’ve got to appreciate for the last six months he’s been sitting on the bench, and not playing many games. “I think he’s got stronger, and understands better how we play. “When he hit the post, although we worked it into an area for him, it was down to him that made it a chance. “I think you can see the progression over a short period of time with him, where he looked a real threat. “We’re still managing him because of playing Saturday, Tuesday, Saturday, Tuesday, in terms of his game-time. Winger Ben Tomlinson came off the bench after a spell out of the side. “Getting players back gives us selection options and decisions to make,” Fullarton said. “It shows the group we’ve got that once you have a fully-fit squad, we can make changes that can influence it. “We’re still managing Ben. He got a reaction to too much, too soon or overuse over that Christmas period. On the absences of full-backs Jacob Hanson and Ryan Sellers, both of whom dropped out of the squad altogether, Fullarton said: “There’s no injuries. We’ve got options now, and what it enables you to do is pick a team based on how you’re trying to play, who you’re playing and where, to give yourselves the best opportunity to win the game.